Villa Chiusa is part of the Castiglion del Bosco estate which has, at its heart, the Borgo, with two fabulous restaurants, a state of the art fitness and spa complex, tennis courts, one of Italy's newest and most spectacular golf courses, a famous frescoed chapel and a shimmering infinity swimming pool that overlooks both Montalcino and the ranging, raw beauty of the Val d'Orcia. This is a property of great elegance with interiors straight out of the stable of Ferragamo, designer fabrics, wood and terracotta floors, fabulous high ceilings and wonderful features such as ranging, spacious, well-appointed rooms with antique and handmade furniture. The living room features an authentic Tuscan fireplace, the dining area is beautifully presented and leads into a designer kitchen, the perfect spot for any budding chef to weave their culinary magic. Upstairs there are three beautiful bedrooms each with en suite bathroom. 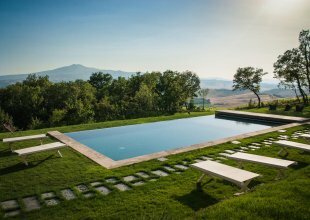 Outside the villa there are landscaped gardens and lawns, a heated outdoor pool in natural stone, with a pool-house with kitchenette and bathroom, a pergola-covered BBQ terrace, a wood-fired pizza oven and spectacular views of the surrounding countryside. 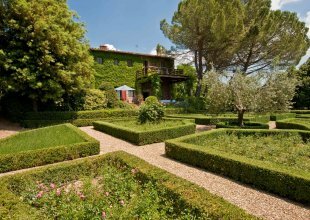 Villa Chiusi is part of the Castiglion del Bosco Estate and comes with daily continental breakfast provided by the estate, a welcome meal, daily housekeeping and full access to all the estates facilities.